'This picture evolved after I had bought some inexpensive cups and saucers from Woolworths for our studio coffee breaks to replace our rather worn old mugs. The angular handles reminded me of arms akimbo, and that led to the idea of making a photograph to express a dance theme. Olive Cotton and Max Dupain were childhood friends and, although she graduated in English and mathematics from the University of Sydney in 1934, her interest in photography led her to work in Dupain’s studio from this year. Cotton was employed as a photographer’s assistant in the studio, however she worked assiduously on her own work and continued to exhibit in photography salon exhibitions. 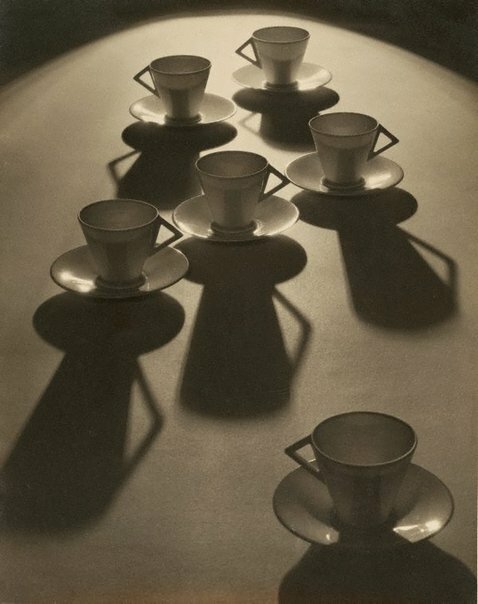 ‘Tea cup ballet’ is one of Cotton’s most well-known photographs and yet it is somewhat eccentric to her main practice, being at first glance typically modernist with its dramatic lighting and angular shapes. Her longstanding interest in organic forms provides a deeper reading. The abstraction of form by the lighting and the placement of the cups and saucers enables the relationship to dancers on a stage to become clear. Signed l.r. sheet., pencil "Olive Cotton". Not dated. Judy Annear, Photography: Art Gallery of New South Wales Collection , 'Australian modernism', pg.131-149, Sydney, 2007, 137, 141 (illus.). Deborah Edwards, Sydney moderns: art for a new world , 'Ultra-moderne: 'Implement blue' and 'The Lacquer Room'', pg.148-153, Sydney, 2013, 152 (illus. ), 184, 203. Janet Hawley, Artists in conversation , 'Olive Cotton', pg. 394-403, Richmond, 2012, xxiv (colour illus. ), 395, 398, 399, 400, 401. Bruce James, Art Gallery of New South Wales handbook , 'Australian Collection: Australian Photography', pg. 198-207, Sydney, 1999, 203 (illus.). Gael Newton, Australian Art Review , 'Photography, Towards a dialogue with other media', p42-46, Rozelle, 1982, 43 (illus.). Review: works by women from the permanent collection of the Art Gallery of New South Wales , The Photography Collection, Sydney, 1995, 17 (illus.). AGNSW Collections , 'From Colonialism to late Modernism', pg. 7-106, Sydney, 1994, 39 (illus.). Great collections , Sydney, 2008, 100 (colour illus. ).